I am using a gyroscope to generate a feedback signal that drives a motor to resist rotation, just as in a camera gimbal. The gyroscope is sampling at 32 KHz with a bandwidth of 8 KHz, and my control loop is running at 1 KHz. Hence, I need to remove frequencies above 500 Hz. At the same time, I need to introduce as little delay as possible in order to be able to use a high control gain. 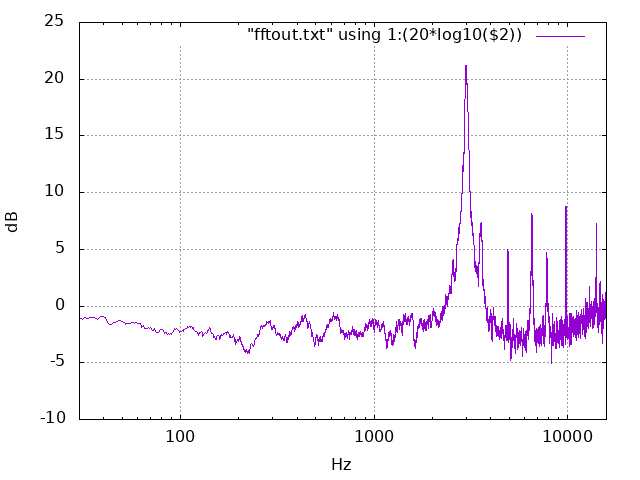 I've attached the FFT of the sensor noise (source). I am a little overwhelmed with the amount of choice available when it comes to filtering this signal. What filter properties should I be looking for? Are there any particularly suitable filters? This is implemented on an FPGA, so computational cost is not a constraint. The lower the cut-off frequency of the anti-aliasing filter, the higher the delay thus degrading your phase margin. You need to be really careful when implementing an anti-aliasing filter in control loops applications. First question, what is the amount of noise above 500 Hz? Based on the picture, you have noise at about 3 kHz, the main purpose of your anti-aliasing filter is to remove this spike, I would not worry too much about content between 500 Hz and 3 kHz. Second question, what is the bandwidth of your control loop? 100 Hz? This is not the same as your sampling frequency. Typically it should be BW <= Fs/10. In your case BW <= 100 Hz. Third question, what amplitude of aliasing can your application live with? If the bandwidth of your control loop is 100 Hz, aliasing occuring at f > 100 Hz will not really impact your performance, you only need to focus on aliasing that occuring at f <= 100 Hz. Even if there's aliasing occuring, if it less than say 1% of the signal of interest, you can probably neglect it. Fourth question, can you run your control loop at 32 kHz? You would not need an anti-aliasing filter then. (I'm assuming that there's already an analog anti-aliasing filter in the gyroscope). If you cannot sample faster than 1 khz, the biggest problem is that the 3-kHz spike will alias to DC (or near DC) . So you need to filter it. I would design a notch filter that removes your 3 kHz spike. This notch filter will add a smaller delay compared to a low-pass filter with a 500 Hz cut-off. However, if you can sample faster, say 4 kHz, then the 3 khz spike will alias at 1 kHz which should be outside the bandwidth of your controller. In that case, I would only design a simple low-pass filter with a high cut-off frequency. Edit : You mention you have an FPGA. In that case keep your sampling at 32 kHz and design a controller with a Bandwidth of like 100 Hz. In that case you don't need to worry about aliasing and noise since the noise will be outside the bandwidth of the control loop. Not the answer you're looking for? Browse other questions tagged lowpass-filter filtering sensor or ask your own question. What is the name of this digital low pass filter?